(Bloomberg) -- Nearly six months later, Genoa is really just starting to dig itself out now. With Prime Minister Giuseppe Conte and other government officials on hand Friday, workers began removing a key part of the wreckage of the suspension bridge that once connected the two halves of the coastal city. Demolishing the remains of the Morandi bridge “is an important moment, it’s the rebirth of Genoa, of the Liguria region and of Italy,” Conte said at the site. The prime minister donned a construction workers’ hat and assisted with the initial works. The work marks the first step in a long-awaited reconstruction plan that will see builders Fincantieri SpA and Salini Impregilo SpA and architect Renzo Piano team up in a bid to resuscitate the city. Genoa was left virtually split in half by the Aug. 14 collapse of the suspension bridge, one of the coastal city’s main east-west arteries. 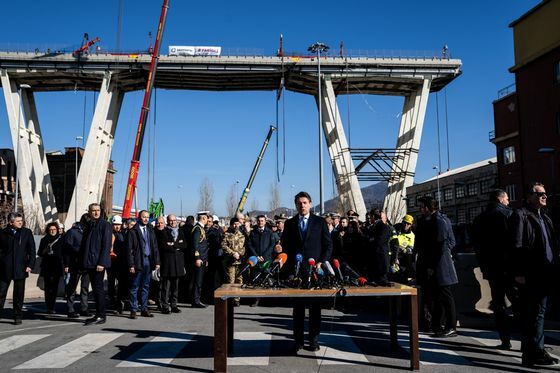 The accident, allegedly caused by a lack of maintenance, caused the death of 43 people and sparked a fierce reaction by Italy’s populist government, which called for the withdrawal of concessions held by Atlantia SpA’s Autostrade unit, the bridge’s operator. Once an overhanging, 36 meter-long section of the broken bridge is destroyed, workers will reopen the so-called “red zone” in the stricken area, allowing residents and businesses to return to the area. Companies including Ansaldo Energia SpA, which has its headquarters near the site, have been hit hard by the bridge collapse. Company employees will on Monday return to their permanent offices for the first time since August, according to a spokesperson. The government has passed a special “Genoa decree” giving the city 30 million euros ($34 million) per year until 2029 to rebuild the bridge and help offset economic damage to the city and its port, Italy’s biggest by cargo tonnage. The Treasury also said Thursday it has readied the payment of the first 60 million euros to finance the works.